Starter Chris Young had a no-hitter into the sixth inning as he dominated the Angels Monday. The Mariners hit the 50-game mark at .500: “I like my team,” said McClendon. Chris Young continued his dominance at Safeco Field Monday, leading the Mariners to a 5-1 victory over Los Angeles Angels in front of a Memorial Day crowd of 22,710. Seattle (25-25) returned to .500 and improved to 23-12 on Memorial Day, best record in the majors. The Mariners built a 5-0 lead against left-handed starter Tyler Skaggs with two in the first inning and three unearned runs in the second. Robinson Cano had two RBI with a pair of singles, Michael Saunders scored two runs and delivered an RBI triple. The M’s had three stolen bases against Angels catcher Hank Conger. Young (4-2, 3.30 ERA) used the early cushion to his advantage. He was aggressive with his fastball and an improved slider. “I made some adjustments in between this start and the last and just tried to be aggressive in the strike zone early,” Young said. The 6-foot, 10-inch right-hander did not allow a hit until Kole Calhoun singled up the middle with one out in the sixth. Young finished 6.1 innings with two hits, one run and three walks. He struck out five, improving to 2-0 with a 1.65 ERA at home. Young is 2-2 with a 5.14 ERA in his five road starts. Is there a change in approach when he takes the mound at Safeco? Young’s addition to the rotation continues to pay dividends with James Paxton and Taijuan Walker still out with injuries. It’s a fact not lost on manager Lloyd McClendon. “I was trying to find the adjectives to describe this guy,” McClendon said. “But what a godsend for this rotation. He’s been tremendous. The only blemish on Young’s afternoon came when perennial All-Star first baseman Albert Pujols connected on a 2-2 pitch for a solo home run in the seventh. Skaggs, meanwhile, settled down after being knocked around in the first two innings to pitch seven for the Angels (28-22). He allowed seven hits and five runs (two earned) while striking out eight and walking two. 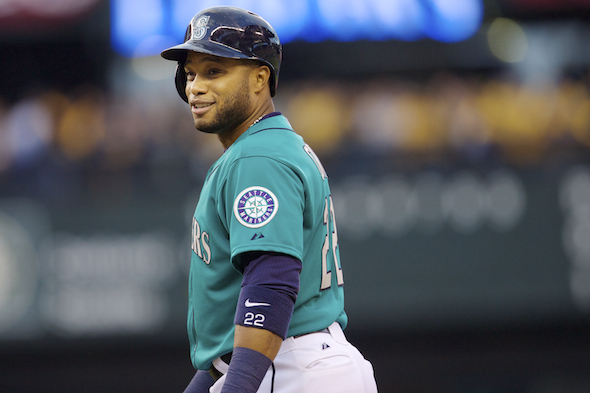 Cano was 3-for-4 with two RBI and a stolen base, his 21st multi-hit game. Saunders, batting second, was 2-for-3 with a triple, RBI and two runs scored. He is hitting .274 thanks to a nine-game tear in which he has gone 13-for-33 with 10 RBI. Skaggs (4-2, 3.97 ERA) was the fourth consecutive left-handed starter the Mariners faced during their current homestand. The M’s improved to 13-8 against lefties and 5-1 versus the Angels. McClendon spoke earlier in the season about using 50 games as a barometer to judge his team. Seattle remains under .500 at home (11-12). The Mariners have scored 80 runs in those games, an average of 3.4, as opposed to 4.6 on the road. McClendon thinks the team will find its footing at home. Paxton had his bullpen session pushed back Monday. He is still dealing with some tightness in his triceps after pitching three innings in a minor-league rehab start with AAA Tacoma Saturday. The team remains cautious as he works his way back from a lat strain that has kept him on the disabled list since April 8. Paxton will throw on the side Tuesday and likely throw a bullpen Wednesday . . . Relievers Charlie Furbush and Danny Farquhar have not allowed a run in 5 and 4.1 innings, respectively, after each pitched Monday . . . RHP Walker remains on target to make his first minor-league rehab start in more than a month with Tacoma Wednesday. I only see Mauer being sent down whenever Paxton or Walker are ready to be called up. Young and Elias have made cases for staying with the M’s.